Another learning experience to improve my penetration testing skills by hacking Mr. Robot virtual machine as my target machine. My private network for this penetration testing exercise. Let's begin. My objective is to find the three hidden keys. Sponsored by Termed.com Life Insurance. I have no knowledge of my target machine (Mr. Robot) IP Address, so let me begin running nmap tool. Of course, you can also use other network discovery tool to scan your network. I prefer nmap tool, it is available to my pentest machine. I discovered my target machine IP address 192.168.159.130 and open ports. That's a basic enumeration, scanning my private network. Port 80 and 443 are interesting ports to start poking around. Let's see what's on this website. I'm calling firefox program direct from the command prompt, of course you can simply click on the Firefox icon and enter the IP Address of the web server. It's cool to use CLI to run a command. Opening the source code, got this fancy "Your are not alone". Checking to see if I can use any of this information to hack Mr.Robot box. Nothing so far. I will come back to this webpage later on. Let's try using "dirbuster" to know our target website. --- snip --- dirbuster still running. I have to cancel it. I think I have enough information to start digging. There are so much information from this dir results. Getting to know of some sub-folders e.g. /admin, /blog, /license, /phyadmin, /wp-admin, /wp-login, /wp-config, etc. I think Mr.Robot box website is using a WordPress content management system. Nice. A webpage with this content "what you do just pull code from Rapid9 or some s@#% since when did you become a script kitty?" Continue to scroll down 'till the end of the page to see this text "
do you want a password or something?" and this code. Look like we have elliot:ER28-0652 username and maybe a password. Let's try to login to Mr.Robot virtual machine and if this account information work. No luck! Continue hacking the box :(. Let me try using this account here, http://192.168.159.130/wp-admin. It's a success! Checking the user, "elliot" username is also the Administrator. Jackpot! And another user micho05654 role as subcriber. I will ignore this subscriber user, and focus to elliot as administrator. Now, I can control this box from here. Exploiting the WordPress CMS since I have an Administrator rights through a reverse shell. Let Kali virtual machine do the work for us. Click on Applications, Exploitation Tools, then click MSF Payload. It will open the MSFVenom Payload Creator in a new terminal window. I run the command below. This command interpret to run msfpc payload create using type php, the IP address e.g. 192.168.159.131 of the attacker using port 433, using msf for cross platform shell gaining full power of metasploit, reverse to make the target connect back to the attacker in a complete stand alone payload (stageless), using tcp standard method of connecting back. I hope that make sense to you, otherwise type --help for more details. And the command to run "msfconsole -q -r '/root/php-meterpreter-stageless-reverse-tcp-443-php.rc'". All ready for me to execute. My listening (attacker) machine ready and waiting for connection. The MSFVenom Payload Creator also provided a website that I can use to exploit my target e.g. python -m SimpleHTTPServer 8080. But in this scenario, I will not use it because I already have administrator access to the WordPress site. All I need to do is install my payload through WordPress as plugin. At this point, I can create havoc to the WordPress installation by deleting contents but the main goal is to own the box (pwn to root or pwn 2 r00t). I will edit the php file with additional information so I can use it as WordPress plugin. Here's the updated php file. Description: A demo using WordPress to establish a reverse shell. Then zip the php file. The payload is now ready. I can use the zip file to upload as plugin in WordPress management console. Let's go back to the WordPress admin page. In Plugin, click add new plugin, then upload the zip file. Browse the zip file, click Install Now. Wait to complete the upload. I've already started the listening machine (above), so all I need to do is click Activate Plugin to create the reverse access. When I check my listening machine, I see our session. From the listening machine, type help to check all available commands. Type "help sessions" to see options on how to connect using sessions. Let me check the home directory. The "robot:c3fcd3d76192e4007dfb496cca67e13b" stands for username:password. I've used online MD5 decryter tool (hashkiller.co.uk) to produce the value of "c3fcd3d76192e4007dfb496cca67e13b" to "abcdefghijklmnopqrstuvwxyz". Wow! the password is so basic. If I run a password cracker earlier, I'm sure I can get this password in under 2 minutes. Anyway, let me login to Mr.Robot box using this username (robot) and password (abcdefghijklmnopqrstuvwxyz). Successfully login as robot and (abcdefghijklmnopqrstuvwxyz). Run ls command to check directory listing. Run "cat key-2-of-3.txt" to view the file. Check if I can "ls /root"
Oops ... it seems more research for me to get the root access. I checked Mr.Robot box nmap version. I can use "nmap --interactive" using !bash to runs shell command. Now, trying !sh to runs shell command. Type "exit" to get out of bash command. It's a success using !sh command. Checking /root/firstboot_done it's empty, and /root/key-3-of-3.txt produce our key "04787ddef27c3dee1ee161b21670b4e4". At this time. I discovered 2 out of 3 keys as listed below. What's next after getting root access? I'm not done yet, my user "robot" still a standard account. 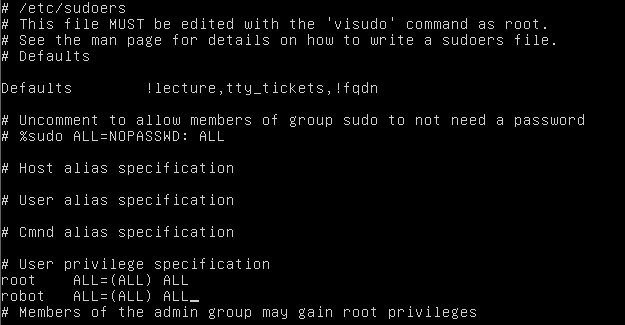 I can escalate the privilege of user "robot" to "root" through editing sudoers file to add "robot ALL=(ALL) ALL". Type nano /etc/sudoers to add "robot ALL=(ALL) ALL". Save it. Exit !sh command, quit nmap, run sudo ls, then enter the robot password. If everything goes well, I can run sudo su for super user. From here, I can do anything to Mr.Robot virtual machine. I can even delete this box by running a command "# rm -r --no-preserve-root". I still need to find the value of key-1-of-3.txt. Going back to the website, check other sub-folders. Checking the http://192.168.159.130/robots/ web page got nothing. Checking the http://192.168.159.130/robots.txt file, shows an interesting information e.g. fsocity.dic and key-1-of-3.txt. Let's download these files and investigate. The fsocity.dic is 6.91M filesize, it could be a word list. Let me download the text file too. The key-1-of-3.txt filesize is only 33KB, very small. I run cat fsocity.dic to check the content, and confirmed it is a dictionary file. I run cat key-1-of-3.txt and produce this result. Found it. key-1-of-3.txt value is "073403c8a58a1f80d943455fb30724b9"
Thank you for reading my walk through. I will create a follow video later this week. And I'm still catching up to all the challenge provided by Vulnhub.com website. https://www.vulnhub.com providing a download of many open virtual appliance (OVA) to play. hashkiller.co.uk - MD5 Decryter online tool. Email: EM@KING.NET to get in touch or use the form below to comment.